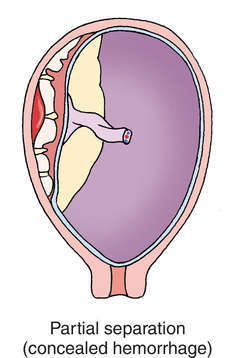 abruptio placen´tae premature separation of a normally situated but improperly implanted placenta; it usually occurs late in pregnancy, but may take place during labor. Separation of the placenta before the 24th week of pregnancy is considered a spontaneous abortion if the abruption is so severe that the pregnancy is lost. Contributing factors include multiple pregnancies (grand multiparity), chronic hypertensive disease, direct trauma to the uterus, or sudden release of amniotic fluid. Premature separation of the placenta is classified from Grade 0 to Grade 3 according to the degree of separation. In Grade 0 mother and fetus are asymptomatic. Diagnosis is made after delivery when the placenta is examined and a clot is found adhering to the maternal surface. Grade 1 is minimal separation that causes some vaginal bleeding and changes in maternal vital signs. Fetal distress and hemorrhagic shock are absent. Grade 2 is moderate separation in which there is evidence of fetal distress and maternal symptoms of a tense uterus and pain on palpation. Grade 3 is the most serious. There is extreme separation which, without prompt intervention, can lead to maternal shock and fetal death. Abruptio placentae. A, Mild abruption with concealed hemorrhage. B, Severe abruption with external hemorrhage. C, Complete separation with concealed hemorrhage. Patient Care. Treatment and patient care are based on the grade of separation and maternal and fetal status. Maternal vital signs are monitored and blood loss is assessed. The uterus is assessed for any tenderness, tension, or rigidity. The location and nature of pain reported by the mother are noted; for example, a sharp stabbing pain high in the fundus can occur when separation begins. Pain that is in addition to the pain of contractions is also significant. Oxygen may be administered to the mother to limit fetal anoxia. Fetal heart sounds are monitored for signs of fetal distress. The patient is kept in a lateral rather than supine position during labor to prevent pressure on the vena cava and further inhibition of fetal blood supply. Vaginal or pelvic examinations and an enema are restricted lest the placenta be disturbed further. Grade 2 and Grade 3 separations require delivery as soon as possible, either vaginally or by cesarean section. Without prompt and effective intervention, abruptio placentae can lead to maternal death from hemorrhage, shock, and circulatory collapse. Fetal prognosis depends on the extent of hypoxia suffered by the fetus during labor and delivery. abruptio placen´tae premature detachment of the placenta. 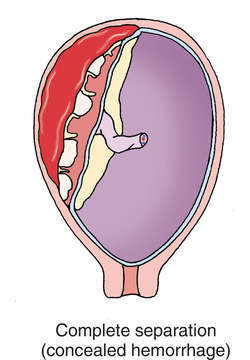 The premature separation of the placenta from its site of implantation in the endometrium before the delivery of the foetus, commonly known as placental abruption. Some degree of AP occurs in 1:85 deliveries; severe AP with total separation of the placenta is an obstetric emergency seen in 1 in 500–750 deliveries, often accompanied by foetal death. Abdominal and/or back pain; irritable, tender or hypertonic uterus; vaginal bleeding (seen in most); 30% are asymptomatic. Pre-eclampsia, eclampsia, chronic hypertension, diabetes, chronic renal disease; mechanical causes are rare (1–5%) and include transabdominal trauma, sudden decompression (as occurs in the delivery of a 1st twin or rupture of membranes in hydramnios) or traction of a short placenta. Local vascular injury of the decidua basalis with bleeding and haematoma formation, which causes shearing of adjacent denuded vessels, exacerbating the bleeding and haematoma; abrupt increased in uterine venous pressure transmitted to intervillous space, resulting in venous bed engorgement and separation of part or the entire placenta. Expectant therapy if foetus is immature and bleeding limited, treat shock if present; vaginal delivery if possible, or else C-section. DIC, acute cor pulmonale, renal cortical and tubular necrosis, uterine apoplexy, transfusion hepatitis. Rare (1 to 5%) mechanical factors such as abdominal trauma (for example, from an automobile accident or fall), sudden loss in uterine volume as occurs with rapid loss of amniotic fluid or the delivery of a first twin, or an abnormally short umbilical cord (usually only a problem at the time of delivery). Predisposing factors include the following risk factors: a past medical history of placenta abruptio (after 1 prior episode there is a 10 to 17% recurrence; after 2 prior episodes the incidence of recurrence exceeds 20%); hypertension during pregnancy is associated with up to 18% incidence (however, approximately 50% of placenta abruptio cases severe enough to cause foetal death are associated with hypertension); increased maternal age; increased number of prior deliveries; increased uterine distention (as may occur with multiple pregnancies or abnormally large volume of amniotic fluid); diabetes mellitus in the pregnant woman; cigarette smoking; and drinking alcohol during pregnancy (> 14 drinks per week). The incidence of placenta abruptio, including any amount of placental separation prior to delivery, is about 1 out of 77–89 deliveries; however, the severe form (resulting in foetal death) occurs only in about 1 out of 500–750 deliveries. Nonphysiologic separation of tissues that should normally adhere. The cause is unknown; however, the condition is most commonly associated with pregnancy-induced hypertension (PIH). It may occasionally be related to abdominal trauma, substance abuse (cigarette, alcohol, or cocaine), or sudden premature rupture of membranes. Abruptio placentae is classified according to type and severity. Grade 1: vaginal bleeding with possible uterine tenderness and mild tetany; neither mother nor baby is in distress; approximately 10% to 20% of placental surface is detached. Grade 2: uterine tenderness; tetany, with or without uterine bleeding; fetal distress; mother is not in shock. Approximately 20% to 50% of the total surface area of the placenta is detached. Grade 3: Uterine tetany is severe; the mother is in shock, although bleeding may be covert; and the fetus is dead. Often the patient develops coagulopathy. More than 50% of the placental surface is detached. 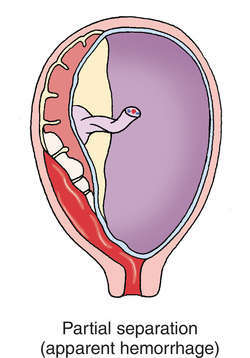 Extravasation of blood occurs between the placenta and the uterine wall, occasionally between muscle fibers of the uterus. Hemorrhage can be concealed or covert, causing consumptive coagulopathy (disseminated intravascular coagulopathy). Although maternal mortality is unusual, other than as noted, the perinatal mortality is between 20% and 30%. Early recognition and prompt management of the event and any associated complications are vital. The woman's vital signs, fundal height, uterine contractions, labor progress, and fetal status data are monitored, including heart rate and rhythm. Any changes are noted, such as prolonged decelerations in fetal heart rate or alterations in baseline variability; uterine tetany; complaints of sudden, severe abdominal pain; and the advent of or increase in vaginal bleeding. Vaginal blood loss is estimated by weighing perineal pads and subtracting the known weight of dry pads. The interval between pad changes, the character and amount of the bleeding, and the degree of pad saturation are noted. Prescribed IV fluids and medications are administered through a large-bore catheter. A central venous pressure line may be placed to provide access to the venous circulation, and an indwelling catheter is inserted to monitor urinary output and fluid balance. A calm atmosphere is maintained, and the patient's verbalization is encouraged. The patient is assisted in coping with her fears and anxiety. Questions are answered truthfully, comfort measures are implemented, and reassurance is provided as possible and consistent with the current situation and prognosis. All procedures are explained, and the woman and her family are prepared for induction of labor, vaginal delivery, or cesarean birth, as appropriate. The woman must be assured that everything is being done for the neonate's survival, which depends primarily on gestational age, blood loss, and associated hypertensive disorders. Separation. From Latin abruptus , broken off. The most common condition among OH patients was abruptio placentae (n=271, 60. Grade II: Intermediate--The classical signs of Abruptio placentae are present, but foetus is still alive. In a hospital based study of abruptio placentae in Burkina Faso, Theiba et al (2003) (8) reported maternal mortality rate of 3. Pulmonary oedema was observed in 2 (5%) women, acute renal failure in 10(25%), DIC in 6(15%), and abruptio placenta in 5(12. Mujeres en tercer y cuarto periodos del parto (alumbramiento y puerperio inmediato) con choque hipovolemico de cualquier grado por placenta previa o abruptio placentae, que durante el parto o el alumbramiento presenten hemorragia obstetrica que cause choque hipovolemico de cualquier grado, o mujeres hasta los 42 dias posparto que presenten hemorragia de causa obstetrica que cause choque hipovolemico de cualquier grado. Three of the intrauterine deaths were caused by abruptio placentae. We emphasize the surprising lack of negative predictive value of a sFlt1 concentration within reference values in pregnancies complicated by abruptio placenta. 5 Abruptio placenta 24 Insuficiencia uteroplacentaria 9 Circular de cordon 8 Prolapso de cordon 4 Anhidramnios 3 Otros 9 4. 11] Changes consistent with abruptio placenta were defined as retroplacental hematoma with intraplacental extension. The well-documented effects of maternal smoking include decreased birth weight, increased rates of spontaneous abortions, abruptio placentae (sudden separation of the placenta from the uterine lining), placentia previa (a placenta that blocks the opening to the cervix), and premature deliveries. Prematurity, pregnancy-induced hypertension and abruptio placentae were observed to be the most common aetiological factors associated with stillbirth, hence better obstetrical care can help in reduction of stillbirth rate.